Everlane is known for their sleek modern backpacks for both men and women. Their lack of loud branding, simple designs and understated colors are what makes the bags so appealing to those who are looking for a mature way to carry. This prompted us to take a look at what else is out there like Everlane and to find backpacks similar in style. Here we’ll share 10 backpacks like Everlane that share the same stylish minimalist designs and must-have features. Baggu’s new line of backpacks are modern, minimalist and incredibly stylish. Their Ripstop backpack is a unisex bag that can be folded into it’s own pocket for easy carry when traveling while still being spacious and durable enough for daily use. These backpacks are made from 100% ripstop nylon, a tough material that is machine washable and can handle even your busiest days. Herschel offers a minimalist single snap backpack with their Post Mid-Volume bag. The Herschel Post backpack is simple, mature and available in multiple colors to match your style. We like the lack of embellishments and minimal branding while still being functional enough for everyday use. Inside you’ll find a roomy 16 liter main compartment with a 13-inch laptop sleeve. This is a great bag for those looking for a similarly priced Everlane Modern Twill Single Snap backpack alternative with more color options. Weekend Shopper offers an affordable daily carry bag with a modern snap backpack of their own. The generous main compartment is perfect for carrying your daily essentials while the outside features two side pockets for umbrellas, water bottles and more. The front pocket features dual compartments for your smaller items that need quick access. Weekend Shopper has crafted the perfect bag for anyone looking for a cheaper Everlane Modern Snap backpack alternative. Knomo is known for their stylish modern backpacks and their Thames Harpsden is no exception. The Thames Harpsden is perfect for anyone looking for backpacks similar to the Nylon Commuter backpack by Everlane. The minimalist design features a front side-entry zip pocket and a generous main compartment with organizational pockets and a 14-inch laptop sleeve. The Knomo Thames Harpsden is also water-resistant thanks to it’s high-frequency welded Nylon and polyurethane lining. 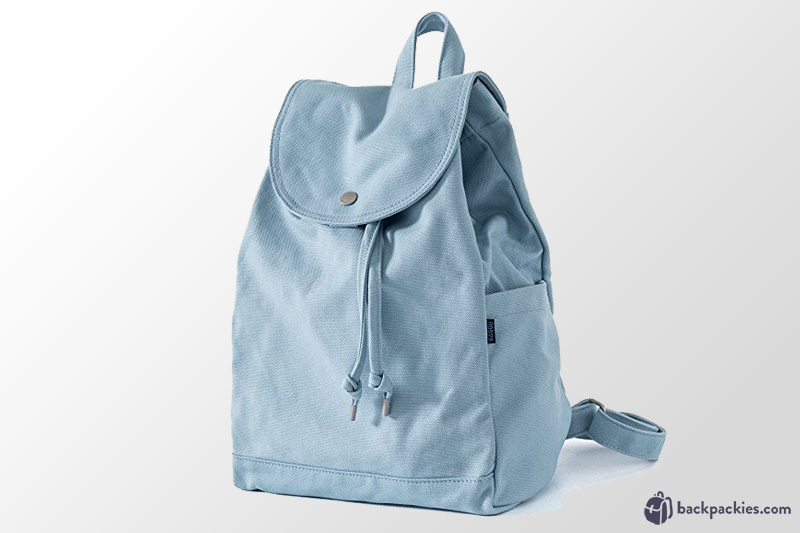 Baggu offers a simple and understated canvas backpack in a stylish drawstring single snap design. One of the best features of this bag is that it’s made of 100% cotton canvas which means it can be machine washed as needed. The simple design allows for a sophisticated look with minimal branding. The Baggu Canvas Drawstring backpack is great for anyone looking for a backpack like the Everlane Modern Twill Single Snap at a more affordable price. 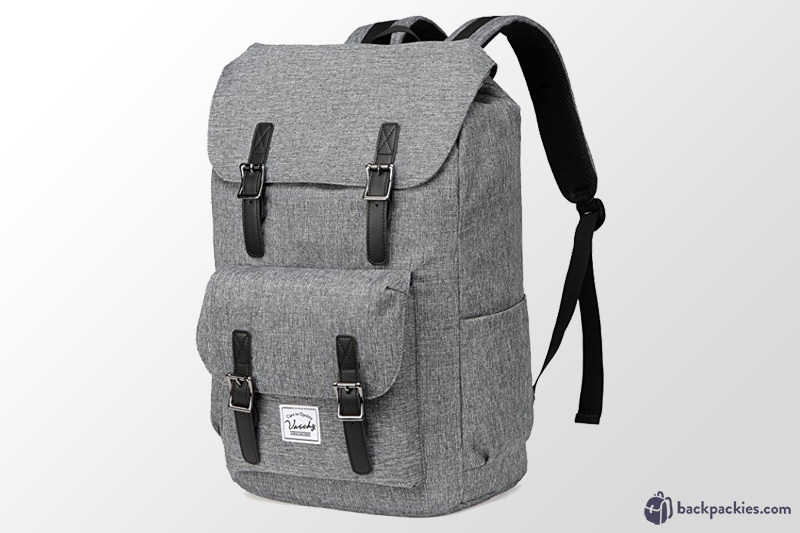 State is a brand that offers stylish backpack designs for both men and women. Their Bedford backpack features a unisex design that is as attractive as it is functional. One of the best features of the State Bedford line of backpacks is the variety of colors and materials that allow you to match your individual style. The Bedford can be found in durable cotton canvas or polyester canvas in a number of sleek color choices. State bags are perfect for anyone looking for backpacks in the same price range as Everlane but with a bit more style variety. Modern yet affordable, Vaschy offers a great Everlane backpack alternative with this classic daypack design. The Vaschy Daypack backpack offers snap-to-close leatherette strap system that makes accessing the main compartment and front pocket a breeze. Inside you’ll find a padded laptop sleeve with plenty of interior organization pockets for your essentials. The bag itself is made of durable water-resistant polyester which makes this the perfect daily backpack for those on the move. We like this backpack for those looking for backpacks like Everlane but at a more affordable price. Herschel Supply Co. offers a small backpack in a modern teardrop design with their Town backpack. The backpack is available in multiple colors to match your personal style and has all the features you have come to expect from a smaller form backpack. Inside the main compartment you’ll find a internal zippered pocket while a front storage pocket give you easy access to your smaller items. Pebbled leather zipper pulls gives the Town a sophisticated edge while the overall design is simple and understated. The Herschel Town is great for anyone looking for backpacks similar to Everlane, especially their Street Nyon Zip backpack. The Booq Pack Pro is for those who love the look of Everlane’s Modern Commuter backpack but need serious storage and organization. This backpack looks sleek and minimalist on the outside while being packed full of storage options on the inside. Features include a dedicated laptop compartment, tech organizers and a hidden iPad pocket. One of the best features of the Booq Pack Pro is that each backpack is tagged with a gunmetal-framed Terralinq serial number that once registered allows you to recover your lost bag. Rains offers a unisex modern zip backpack that is sure to turn some heads. The Field Bag is Rains’ take on the classic school bag but with a minimalist twist. The simple design makes this backpack great for school while also being mature enough for daily commutes to work or for travel. Like all of Rains products, this backpack is completely waterproof.